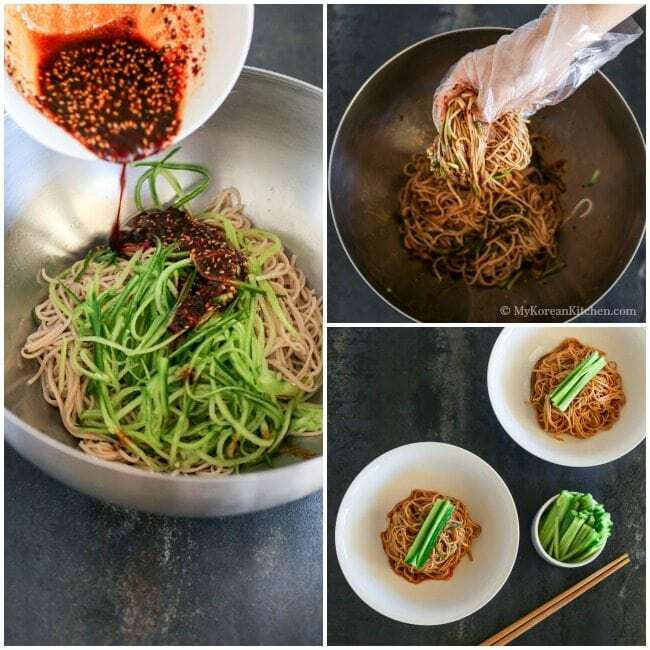 Summer ready cold soba noodle recipe – cucumber soba noodles with sweet chili soy dressing! Soba noodles are one of my favorite noodles and I often think about a new way to indulge myself into this deliciousness. 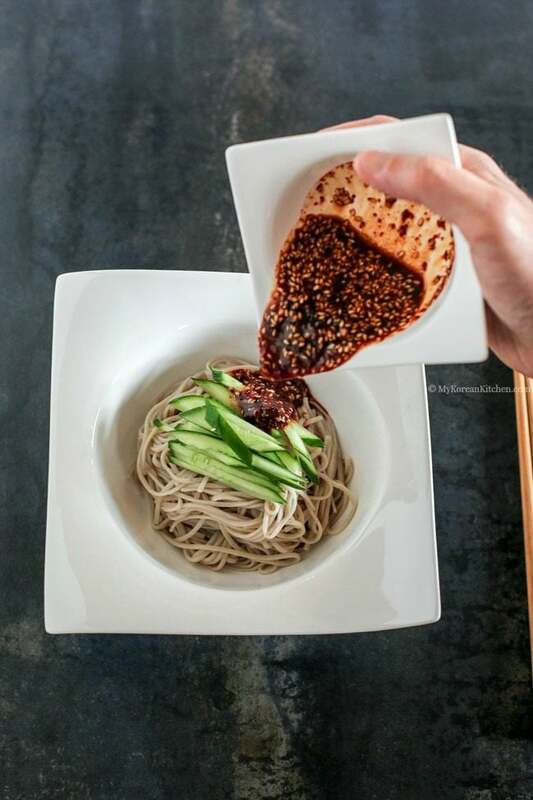 In the last few weeks, I couldn’t stop thinking about pairing some cucumber with these soba noodles and also with homemade sweet chili soy dressing. They just sounded like a perfect match to me. This soba noodle dish is a perfect for late spring or summer days. It’s light, refreshing and more-ish. I keep think about it even just a few hours after I have these noodles. They’re addictive! Thankfully, Brisbane (in Australia), where I live displays reasonably constant mild weather most of the colder months. So I can appreciate this goodness pretty much all year round. It’s also a quick and easy meal. You should be able to whip this up in 15 minutes or less. Sounds good? Then why not try this recipe out this weekend? I hope you enjoy my recipe as much as I do. 1. Make the sweet chilli soy dressing by mixing the listed ingredients above. 3. 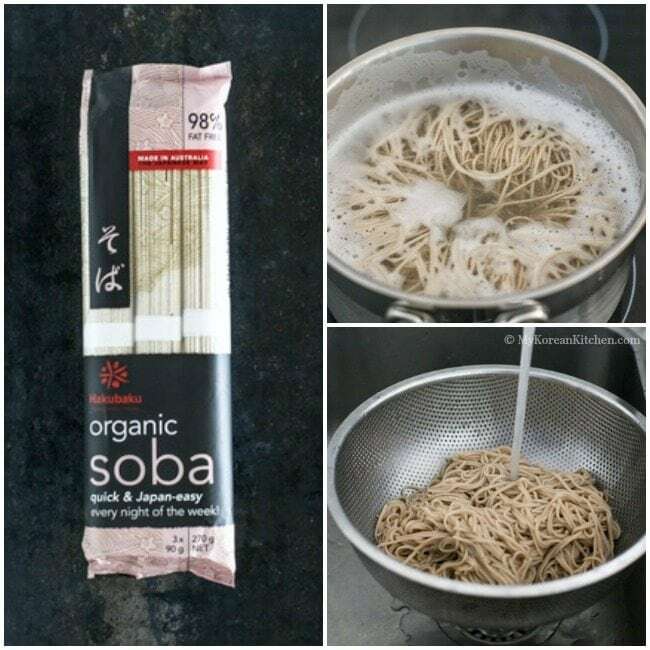 Cook the soba noodles in rapidly boiling water until al dente. (Follow the directions from the package.) Drain the water and cool down the noodles under cold running water for about 1 minute. Stir the noodles with some tongs or your hand while it’s under the water. Drain the noodles well. 4. 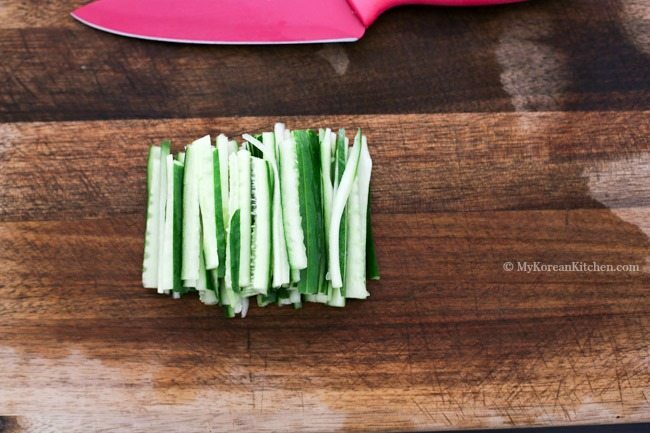 Put together the noodles, cucumber and dressing in a large mixing bowl and mix them well with your hands. (Wear a food handling glove). Serve it in a pasta or noodle bowl. Alternatively, you could serve them individually without mixing them so your guest has some fun mixing these together. In this case, about 2 Tbsp of the dressing sauce per person should be adequate. 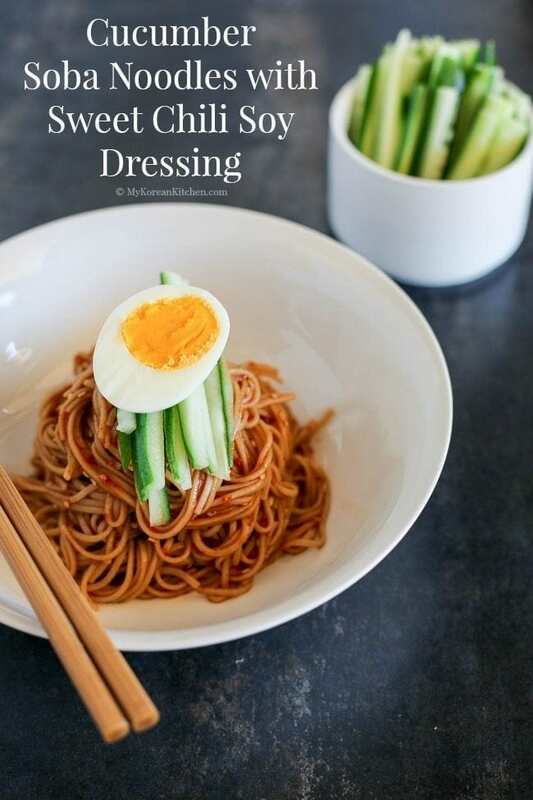 You should mix the noodles, cucumber and dressing together when you are about to eat. Otherwise the noodles will steal your sauce away and it will taste drier. 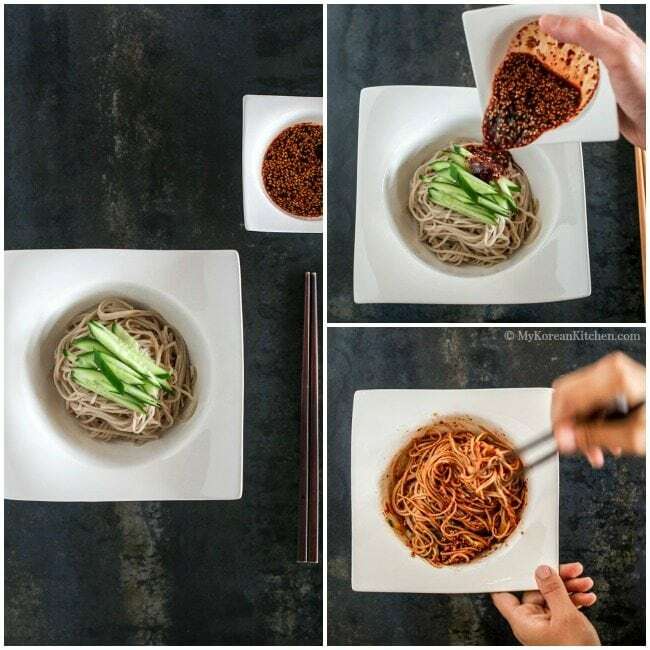 Delicious cold soba noodles dressed in sweet chili soy dressing. It's a perfect way to beat the summer heat! Make the sweet chilli soy dressing by mixing the listed ingredients above. Cook the soba noodles in rapidly boiling water until al dente. (Follow the directions from the package.) Drain the water and cool down the noodles under cold running water for about 1 minute. Stir the noodles with some tongs or your hand while it’s under the water. Drain the noodles well. Put together the noodles, cucumber and dressing in a large mixing bowl and mix them well with your hands. (Wear a food handling glove). Serve it in a pasta or noodle bowl. Alternatively, you could serve them individually without mixing them so your guest has some fun mixing these together. In this case, about 2 Tbsp of the dressing sauce per person should be adequate. Hi! 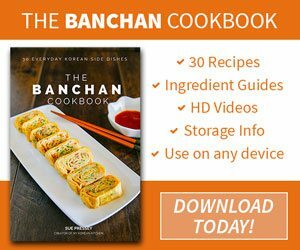 So I want to learn how to cook korean dishes and i came across your website and fell in love with it. Anyways I was wondering if we have to use those specific type of noodles? I dont think me and my mom will be able to find them in stores where i live. Thank you! I made this the other night and I think it will become a staple in our house! It was so quick, easy, and refreshing. I love tanginess so I added more vinegar and I julienned a carrot as well for some extra veggies. Hi Minha, There are many Korean recipes that use gochujang, so you don’t need to worry about how to use it up. 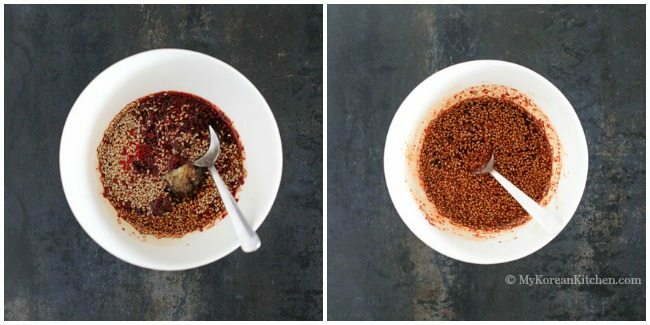 Just type “gochujang” in the search bar then you will see many recipes that use it. In terms of substitution in this particular recipe, you can start adding 1 tsp of gochujang and see whether you like the taste. You can increase a bit more if you want it to be spicy. Though as this recipe is designed to be used with gochugaru, the taste will be different to what I intended. Nonetheless, it should still work. Thank You! I really apreciaite it! 🙂 I’ll see what I can find. I love how simple this recipe is…and so yummy-looking, too! 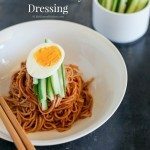 I love Korean food and flavors so I’m glad I found your blog! Hi Oana, I’m glad that you found my blog too. I hope you enjoy trying my recipes and thanks for stopping by! Hi, Sue! I’m really enjoying your blog! 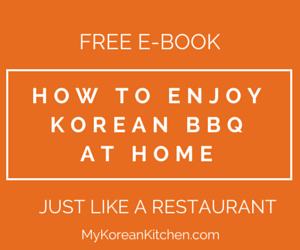 I’ve come to love all things Korean, and your recipes have inspired me to try cook many dishes. 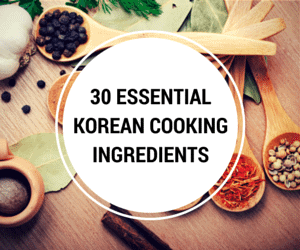 I was wondering, though, if you could put the Korean name (example Korean chili powder) in your recipes. Our Asian market carries many Korean ingredients, but I’m not sure if I’m buying the correct thing. Keep up the great job. I’m a huge fan!